Size: 4.6" x 2.9" x 0.40"
Texas Instruments announced on March 8, 2010 the new TI-Nspire Touchpad and Operating System 2.0. 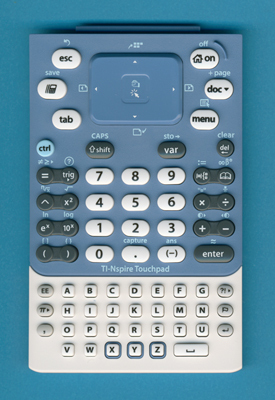 The new OS 2.0, including the TI-84 Plus Silver Edition 2.54MP, was released for the TI-Nspire with Clickpad, too. This blue colored Touchpad is available as an option for the 1st generation TI-Nspire calculators selling for US$ 10.00. Don't miss the blue TI-Nspire Touchpad. © Joerg Woerner, August 27, 2010. No reprints without written permission.